I’m not sure how I became the spokesperson for all things Iced and Coffee, but I LOVE the stuff so much that it just seems fitting. 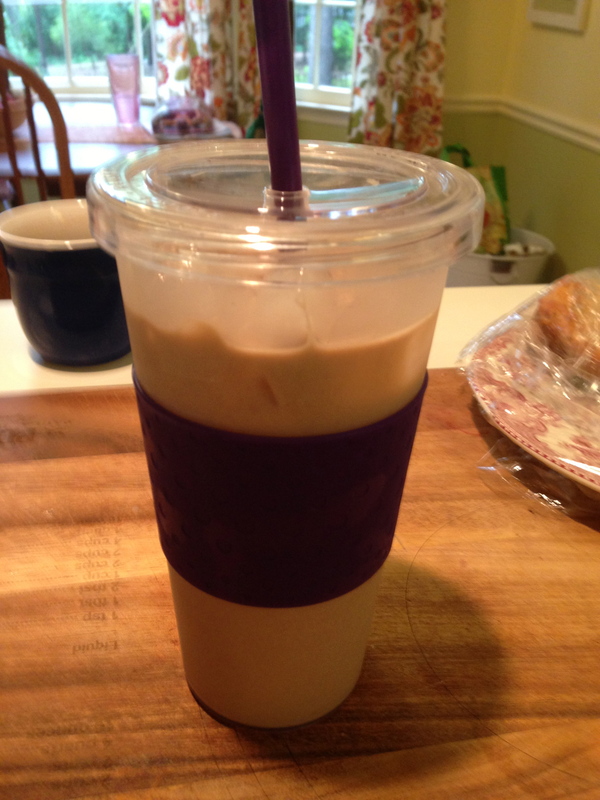 Even in times when I’m seriously counting calories, I carefully budget (and measure) in my one Iced Coffee per day. Pour the coffee in a large pitcher, add sugar and stir. Add Milk until it’s the desired color you like. Taste for sweetness, add more sugar if needed. Stir again until sugar is disolved and then place in the fridge for several hours or overnight. Serve over lots of ice in a glass, if you have a a mason jar, even better. Keep in mind, whenever you have a partial pot of coffee left over in the morning, don’t throw it out!!! You can do this and have a delicious treat the next morning instead of having to talk yourself out of swinging by Starbucks!!! This is WAY more cost effective and you can drink it in your P.J.’s!!! Method 2: Making a Coffee Concentrate. I make up (or more accurately, my moonlighting barista husband makes up) a small batch of very strong coffee. He makes his daily coffee on the strong side anyway, so I can basically take that, chill it and it makes perfect iced coffee. But usually, we will make a batch of strong coffee, either by french press, espresso pot, or in the regular old coffee pot. There is also this method of Cold Brewing your coffee. It’s pretty good too. Step 1: Brew your Strong Coffee and place it in the fridge over night or for at least a few hours. Step 2: Prepare your Sweetener, usually a Simple Syrup like this one. I always do 1:2 ratio of water to sugar. Raw Sugar works nicely too. I recommend keeping this in the fridge, if you don’t want to, buy it. At times, I will visit my friendly neighborhood Starbucks, and they will sell me a large bottle of flavoring syrup in Vanilla, or Hazelnut or whatever for around $8.00. (Reasonable vs. several lattes at said Coffee Shop.) And no refrigeration needed. Step 3: Using a small glass, preferably a different one than you will drink from, measure out the concentrate you want. Add your syrup to taste. Add a small splash of half & half and then add a bit of milk until you reach your desired color. Pour into another glass full of ice and Enjoy! I like this method especially for entertaining because others can truly customize it to their tastes. Now grab yourself an Iced Coffee, a muffin (or a cookie!) and a good book! 4 Things I Love Right Now, and 1 That I Do Not. I’m so glad you posted this! Yum! First of all, as an English teacher, thank you, thank you, THANK YOU for writing “iced,” and not the delinquent “ice” before coffee, which is just so wrong. 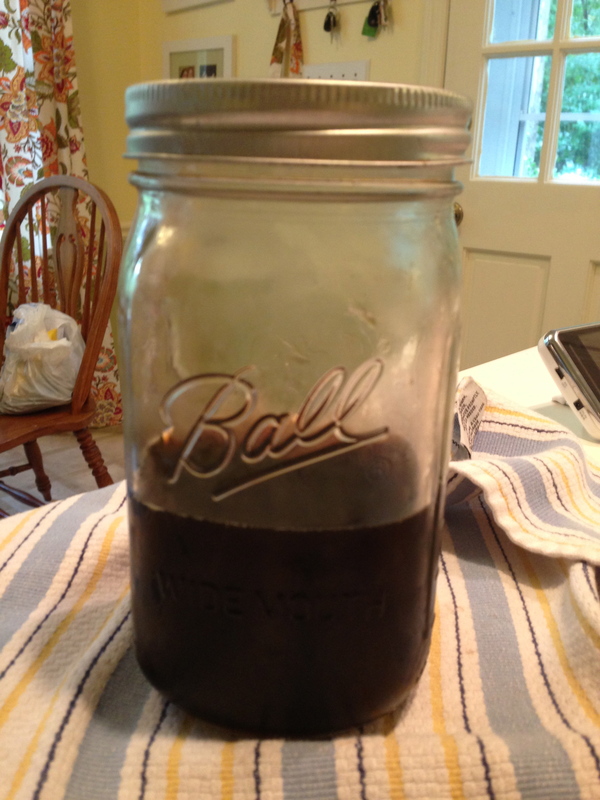 Secondly, as a former barista, I MUST share the BEST, and far less messy, way of making cold-brewed coffee, which is also the best thing I got from Borders before they closed down completely (I was a bookseller and a cafe employee, plus a Starbucks stint): http://toddycafe.com/ . Starbucks, having inherited (i.e. destroyed, swallowed whole, etc.) Seattle’s Best, now sells the Toddy system in many of their stores, but I encourage any and all connoisseurs of iced coffee to try it out. Rich, creamy perfection, as the Pioneer Woman says, with half the mess. That said, kudos for touching on my favorite way to save time and waste with the in-the-fridge-from-the-morning-coffee tip. I do both, now that I’ve lost the tiny plug for my Toddy system (reordering parts is SO not my style. I do, however, buy toddy coffee anytime I see it in a shop–like the one I’m about to go in). * First comment submitted early; I didn’t type my whole blog address. Sorry!